NEW YORK - Secretary-General Ban Ki-moon on Monday announced the launch of a near $120 million appeal to fund United Nations aid activities in the aftermath of Hurricane Matthew in Haiti, where the rising death toll coupled with the start of the rainy season has prompted the UN Children’s Fund (UNICEF) to sound the alarm on the threat of waterborne diseases to children living in the worst-affected areas. “Hundreds have died. At least 1.4 million people need assistance at this time. Some towns and villages have been almost wiped off the map. Crops and food reserves have been destroyed. At least 300 schools have been damaged,” Ban told reporters at UN Headquarters on Monday, expressing his deepest condolences and sympathies to those affected by the hurricane. He said the numbers of those impacted and the needs are growing as more affected areas are reached. Moreover, tensions are already mounting as people await help. “A massive response is required,” he said, adding that UN teams are working with local officials to assess needs. “Today in Geneva, we launched a $120 million flash appeal covering the UN system’s needs for the next three months,” the secretary-general announced, recalling that this past Friday, the UN Central Emergency Response Fund (CERF) allocated $5 million in emergency funds to kick-start assistance in the wake of the deadly storm, following the release earlier in the week of a loan of $8 million dollars to the UNICEF to scale up response to the worsening cholera epidemic in Haiti. 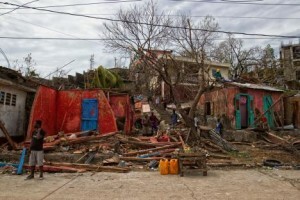 The so-called Flash Appeal, launched by the UN on behalf of the international humanitarian community, requests $119,850 to respond to “the most urgent needs” of people impacted by the storm, which made landfall in Haiti on 4 October and went on to leave a swath of devastation throughout the Caribbean and the South-eastern United States. 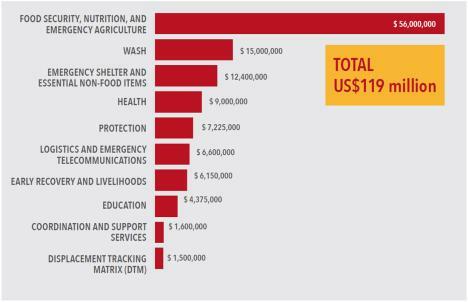 According to the UN Office for the Coordination of Humanitarian Affairs (OCHA), the appeal targets vulnerable groups in identified priority sectors, and it takes into account the national-level capacities and those of humanitarian partners on the ground. Over the next week, partners will develop individual projects in support of sector activities and financial requirements identified in this appeal, adapting the response to the most up-to-date assessment results. Ban went on to note that he is developing a new approach to the cholera situation, which will encompass support for people affected by the disease and for efforts to build sound water, sanitation and health systems in order to help eliminate cholera in Haiti. This disaster makes it even more vital to significantly step up our support and to do so right now, he stressed. “The United Nations is mobilizing across all fronts to support the people, the Government and local groups such as the Red Cross in getting recovery under way as quickly as possible. I call on the international community to show solidarity and generosity – and to work together effectively in responding to this emergency,” stated the secretary-general. Meanwhile, UNICEF has warned that overflowing rivers, stagnant waters, and animal and human corpses are perfect breeding grounds for waterborne diseases. “Every day that goes by increases the threat of cholera. We are in a race against time to get to these children before diseases do,” Marc Vincent, UNICEF representative for Haiti, said in a press statement. Even before the hurricane in Haiti, UNICEF noted that only one in three people had access to proper latrines and less than three in five to safe water. In rural areas, these rates go down to one in four for sanitation and one in two for water. Diarrhoea is one of the main killers of children under-five in the country. “Haiti has one of the highest incidence rates of cholera in the world,” Vincent underscored. “Almost 10,000 people have died from the disease since 2010 and more than 27,000 suspected cases have been reported so far this year, an estimated one in three of them children,” he added. Since the 2010 outbreak, UNICEF, in partnership with the Haitian government and various partners, has been fighting waterborne diseases – including cholera – by improving access to water, sanitation and health services for Haitian children and their families, while promoting rapid response to cholera cases. From that time until now, UNICEF has established or maintained 1,270 oral rehydration points and 149 cholera treatment units in high-risk areas where nearly 140,000 suspected cases were treated. In June and July of this year alone, the agency responded to more than 1,000 cholera alerts in all 10 departments of the country, benefiting about 8,000 households. “With the hurricane’s devastating impact on an already fragile system, UNICEF will continue to scale up its cholera response and address the emerging water and sanitation needs,” Vincent vowed, noting that key components of UNICEF’s immediate response include acquiring water purification tablets, treating collective water sources, and setting up latrines in temporary shelters and informal settlements. The western cities of Les Cayes and Jeremie suffered the full force the Category 4 hurricane – sustaining heavy rains, winds and water damage across wide areas. In addition to the water treatment supplies pre-positioned before the hurricane hit, on Thursday, 6 October, the first truck arrived in Les Cayes with water-treatment tablets and water bladders. On Monday, six water trucks were on their way there and to Jeremie. “In addition, a water bladder was made available for the hospital of Les Cayes and more water storage containers are on their way to the affected areas to be used in shelters housing displaced families,” concluded the UNICEF Representative.